We’ve already discussed in one of our articles what the best time is for giving baby solid food. Today, one of the most common recommended diet by doctors to infants who are eating solids for the first time are cereals. But are cereals really okay for babies? That’s one of the questions we’re going to answer in this post, plus, we’ll give you our top pick of what we think is the best baby cereal available for your little one. We had to make sure our top five choices of baby cereal is sourced only from ingredients that have been grown and cultivated the natural way. In short, they had to be void of any chemical or substance that might be detrimental to your child’s health. While we can easily say that a product is “organic” even though it’s not 100% chemical free, we assure you that what we recommend are only those that come from reputable and trustworthy manufacturers. Speaking of trustworthy, we’ll start our list with one from Gerber. 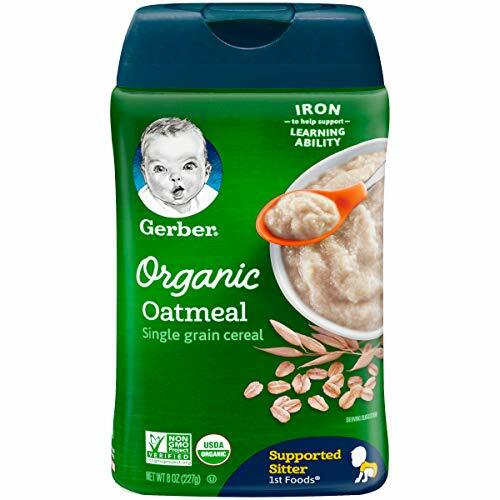 A reputable brand, Gerber is known for focusing on single-ingredient formulations, and their Organic Oatmeal Baby Cereal is not an exemption. This one, in particular, is made from organic whole grain oat flour that contains wheat. It’s fortified with calcium, vitamin C, and a combination of six B vitamins. 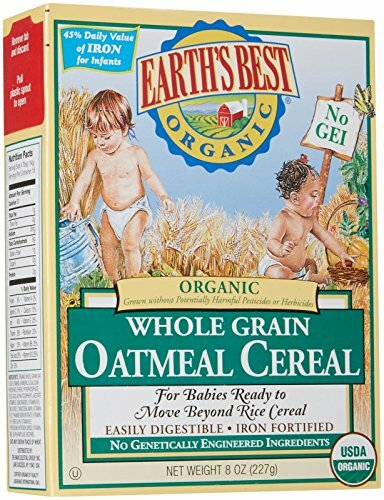 A certified non-GMO product, this cereal does not contain any genetically engineered ingredients and is sure to aid in your child’s optimum development and growth. This is a single-ingredient cereal, which makes it easier for you to identify hypersensitive reactions in case there are any. Easily mixes in with formula or breastmilk. The container design makes measuring, feeding, and even storage very convenient. The spout may be too large and makes it easy to create a mess when you’re in a hurry. If you have a kid who’s a bit fussy when it comes to rice cereal, you should try the NurturMe Organic Infant Cereal instead. Not only does it contain nutritional quinoa, but it is complete with both essential and non-essential amino acids. It also claims to be the first and only baby cereal to offer purely natural occurring plant-based nutrients. This means it doesn’t cause indigestion at all, something that can be a problem with synthetic nutrients found in some brands. Packed with vitamin A, vitamin D, several B vitamins, plus Copper, Magnesium, Zinc, and other vitamins and minerals, this is definitely one of the most sought-after baby cereal brands nowadays. It’s a combination of carbohydrates, protein, and other vitamins and minerals, making it one of the healthiest choices of baby cereal. It’s high in natural fiber and promotes proper digestion. It’s quite cheap for a nutrient-packed baby food. The texture of quinoa may take a little time for your child to get used to. Earth’s Best produces some of the best organic baby food. Their whole grain oatmeal cereal is a particularly excellent choice if you’re considering single-grain options for your child. It contains a combination of vitamins and minerals that include vitamin E, vitamin B1, vitamin B3, and vitamin B6. What makes it a great choice, too, is that it doesn’t contain refined sugar, salt, and preservatives. Despite that, it still tastes great and one that your baby will surely love. Most importantly, since it’s certified organic, you can rest assured that it does not contain any ingredient that may be harmful to your child’s health. The taste and the texture of this cereal make it an excellent food for babies who are just learning to eat. It’s creamy and has a nice consistency to it. 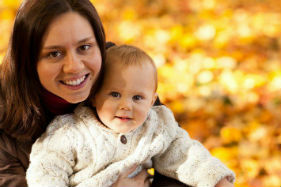 Since it’s from Earth’s Best, you can be sure of its overall quality an organic baby product. The packaging is not designed for easy measuring and pouring. 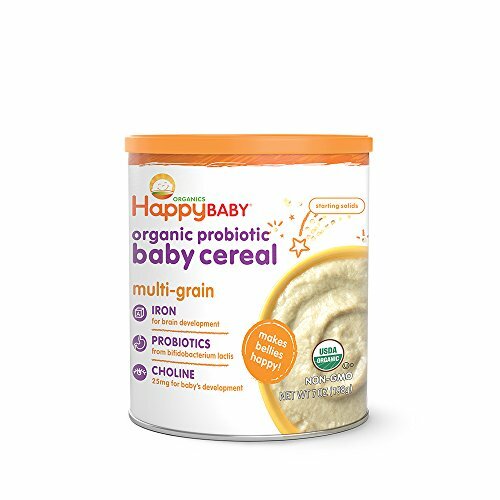 Each brand of baby cereal has its highlights, and what we liked about this baby cereal from Happy Baby is that it’s enriched with choline. Choline plays a significant role in the development of a child’s nervous system, and you’d be glad to know that this organic probiotic baby cereal contains it as a main ingredient. Aside from that, this cereal also offers a combination of amaranth, chia, and quinoa, all of which are excellent sources of protein, iron, and fiber. Not only that, but it also offers probiotics such as Lactobacillus Plantarum, Lactobacillus Salvarius, and Lactobacillus Acidophilus among several others. 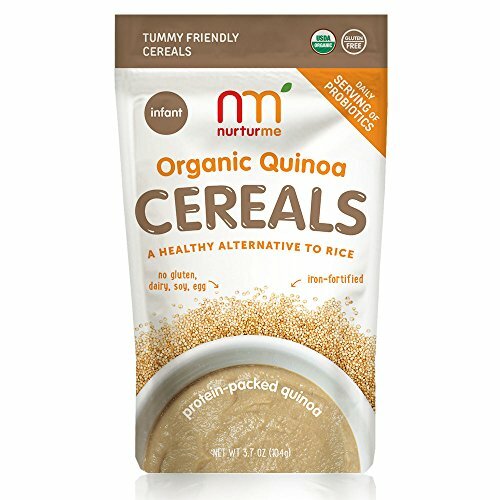 For babies who are ready to level up from single-grain cereal meals, this could be a perfect choice. This is an excellent choice if you want something to thicken your child’s formula. This cereal has a good texture and is not as flaky as other brands. The container makes it easy and safe to use and store. Some parents may find this to be a bit pricier than its counterparts. WutsupBaby was started by Kaiser and Sheryl who consider themselves “thinking, health-focused parents.” While the company is not as big or as famous as the rest of the brands on our list, it’s definitely one of the go-to names out there when you’re talking about baby cereal. 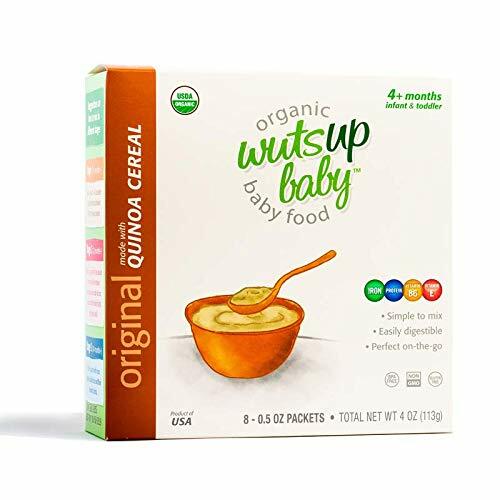 All ingredients in the WutsupBaby Quinoa Cereal, in particular, came from what is referred to as “identity preserved, non-GMO seed.” Just like NurturMe, this cereal is nutrition packed and consists of prebiotics, Iron, Magnesium, protein, and vitamins E and B2. What makes this cereal unique, however, is the fact that it’s considered very close in profile to breastmilk, which is why it’s often praised by nutritionists. This cereal comes in travel packs, making it fast, versatile, and convenient to use even when you’re in transit. The texture is very soft and easy to mix and feed to your child. It’s sweet and nutty aroma, and taste makes it easy for your child to like. It does not contain vitamin A. We based our decision not only on the nutritional value of the contents, but also on the texture, smell, and taste of the cereal. How the product was packaged also played a huge role on our verdict. The packaging has to be sturdy and properly sealed, but at the same time, it has to be easy to open and pour. Based on these criteria, our winner is none other than the NurturMe Protein Packed Quinoa Organic Infant Cereal. It’s certified organic, and is free of gluten, GMO, added salt and sugar, and artificial preservatives and flavorings. Compared to the rest of its counterparts on our roster, it’s also the most convenient to use even when you’re on a trip. And as we’ve mentioned earlier, it’s very affordable for something that’s packed with vitamins and minerals. It is, in fact, the cheapest brand on our list. To sum it up based on the words of the manufacturer, it’s nutritious, it’s convenient, and it’s innovative. To find out more about this organic baby cereal, check out this short video from NurturMe. Baby cereal, or rice cereal as it is often called, has been the number one recommendation of doctors in the 20th century as the first food for babies who are ready for solids. What made baby cereal very popular among parents, especially those from the United States, is that such type of food is quick and convenient to prepare and feed. Rice is a simple food, too, which means it has a bland taste, something that any newborn can easily accept. Also, it has a nice texture to it and one that can be easily adjusted to the child’s preference. Another reason is that it poses minimal risk for allergic reactions. And if you want to make it “healthier” and “tastier” you can easily mix it with fruit or vegetable puree. But is baby cereal really healthy? Some people do not think so. Others even consider it a mark of lazy parenting. Those who are not a fan of it say that since it’s mostly white rice, it doesn’t have any real nutritional value to it. This is the reason it’s fortified with iron, vitamin B9, vitamin C, and other synthetically produced vitamins. What’s worse is that some people claim the digestive system of newborn babies is not able to digest grains yet. So, here’s another question: Is baby cereal really that bad? Nope, baby cereal is not a perfect food source for any newborn, but it does go a long way in preventing iron deficiency. Aside from that, they’re also safe and convenient, quick to prepare, and easy to mix with your child’s milk. And even if you’re a vegetarian, you can rest assured that there’s a brand of baby cereal for you and your little one. Start With Simple Choices. Any type of food you introduce to your child for the first time must be monitored carefully in case your child may have an allergic reaction to it. In adding cereal to your baby’s diet, it’s recommended to start with single-grain options so you can better monitor your child’s reactions and easily identify possible allergens. And before you go out shopping for infant cereal, make sure you’re not starting your child too soon. Choose A Version. Baby cereal may come in a “add-water” or “add milk” version. The former comes with milk powder along with vegetable oil or probiotics, while the latter has the grain only along with added vitamins and minerals. If you already know that your baby tolerates either formula or breastmilk, it makes sense to choose the “add milk” version. What can you say about our pick of the best baby cereal? Do you have any other brands that are not found on this list? Let us know in the comments section below. And please don’t forget to share this post and spread the word if you found it helpful. Thank you!